Patients with minor chips, cracks, stains, and gaps on the enamel surfaces of teeth may think that porcelain veneers are their best option. However, there may be a budget-stretching, one appointment alternative – direct bonding. This cosmetic dentistry procedure uses tooth-colored composite resin to conceal or correct smile flaws. This same high quality material is used to create natural looking, long lasting tooth-colored fillings. The direct bonding process is simple. We use a local anesthetic to numb the treatment area. Then, we prepare teeth as necessary, and the dentist applies an etchant material that creates a more porous surface to which the bonding material can adhere. The putty-like resin is placed directly onto the prepared tooth or teeth and molded into place. A curing light hardens the material, creating a flawless smile. If you’d like to find out more about direct bonding, contact the La Plata Dental team to schedule your cosmetic dentistry consultation today. 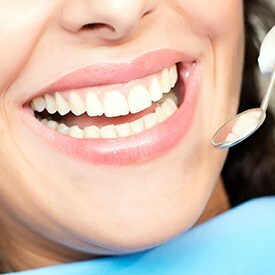 We’ll assess your smile and help you find the best possible treatment to deliver the gorgeous smile you deserve.